Lelo in Nopo: Choosing a new house paint color? Keep in mind the color of the rhodies. It might clash. What's wrong with a big bowl of Orange Sherbet (or is it sherbert?) paired with a scoop of raspberry? I can't believe you had your place painted! Ours had the body painted yesterday and the trim and restof it will be done by the end of the week. Must be the season! Colors are one heck of a tricky business. I don't think it looks bad at all. 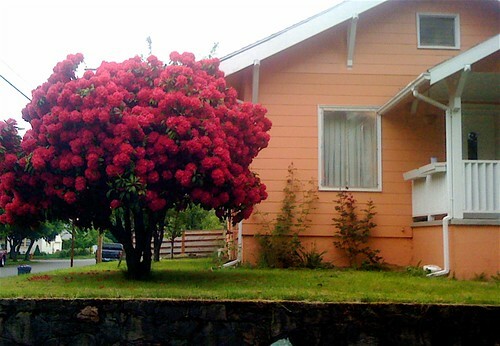 And for most of the year when the Rhododendron is dark leafy green, it's going to look fantastic against your house. I probably should have labeled this post "snarky." As in, whoa, check out the color clash. No, Lewis, this is not our house. But the color combination was so shocking in real life I had to take a picture. And Cuisine Bonne, it is EXACTLY the color of orange sherbet! Hee. Lelo's house is very tasteful indeed -- before I knew it was hers, I would walk by and sigh longingly at it. "Those folks have style," I'd think. Now that I've met you both, I am even more certain it's true. As for the peach house people, well, that was a triumph of gardener's ambition over forethought, IM(NS)HO. But hey - at least their rhodies don't look all sad and diseased like mine. Previous owner painted my house guacamole green. I laughed when I first saw it, but it's growing on me. At least it doesn't clash with the shrubbery. Is it crazy that I kind of like this? I may just be saying that because we're painting our front door orange and our dogwood blooms pink!